This is a scarce and beautiful 1850 pocket map of New York City published by Ensign, Thayer and Co. It covers Manhattan from 32nd Street south to the Battery and Brooklyn from Navy Yard to Sackett Street as well as part of Williamsburg. A large part of Governors Island is also included. City wards are number and coded with outline color. All streets are identified, and countless important buildings are noted. Ferry routes cross the East and Hudson Rivers in numerous places are identified, and the map is gridded in quarter-mile sections. A key in included below the title, which also notes the 'strokes of bell' for fire alarms in the first, second and third district. The map notes the original city of Columbia College near Park Place. An inset of Jersey City and another large inset of the Northern part of New York Island are featured in the top left quadrant. 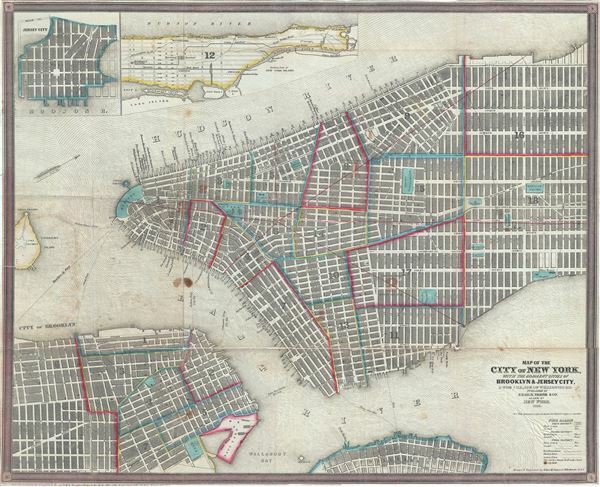 Although the northern part of Manhattan was undeveloped at the time, the map clearly depicts the Croton Aqueduct and the Harlem and Hudson Railroads. Bloomingdale Road, the oldest north-south main road in New York which would eventually become Broadway, is also noted. Very good. Verso repair over split along original fold lines. Toning along fold lines. Some spotting at places, especially over the East River near 21st St. Professionally flattened and backed with archival tissue. Accompanied by original binder.